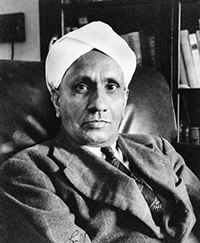 Sir Chandrasekhara Venkata Raman won the 1930 Nobel prize in Physics "for his work on the scattering of light and for the discovery of the effect named after him." He held positions at Calcutta University and the Indian Institute of Science, and founded the Raman Research Institute. November 7, 1888Birth, Tiruchchirāppalli (India). 1904Obtained BSc degree in Physics, Presidency College, University of Madras, Chennai (India). 1907Initially decided to pursue a non-scientific career, Indian Finance Department. 1907Obtained MA degree, Presidency College, University of Madras, Chennai (India). 1918Palit Chair of Physics, University of Calcutta, Kolkata (India). 1919Honorary Secretary, Indian Association for the Cultivation of Science, Kolkata (India). 1922Published "Molecular Diffraction of Light". 1928Discovered the Radiation Effect, now called the Raman Effect. 1930Awarded Nobel Prize in Physics "for his work on the scattering of light and for the discovery of the effect named after him". 1933 – 1948Professor of Physics, Indian Institute of Science, Bangalore (India). 1948Director and Founder, Raman Research Institute, Bangalore (India). Advised by Raman at Raman Research Institute, Bangalore. Advised by Raman at University of Bangalore. Advisor at Presidency College, University of Madras. Advised by Raman at University of Calcutta. Advised by Raman at Indian Association for the Cultivation of Science. Advised by Raman at University of Madras. Advised by Raman at Nagpur University. Advised by Raman at Indian Institute of Science, Bangalore. Received BSc in Physics (1904) and MA in Physics (1907), Presidency College. Chandrasekhara V. Raman papers, 1930-1975. Gilbert Newton Lewis papers, 1908-1945. Oral history interview of Betty Compton, 1968 April 11 and 15. Oral history interview with Max Born, 1960 June 1, 1962 October 17 and 18. Oral history interview with S. Chandrasekhar, 1977 May 17, 18 and October 31. W. Wilson papers, 1910-1957; 1960-1985. C.V. Raman : a pictorial biography / compiled by S. Ramaseshan and C. Ramachandra Rao. Scientific papers of C. V. Raman / Sir C.V. Raman ; edited by S. Ramaseshan. The new physics; talks on aspects of science. Chandrasekhara Venkata Raman / A. Jayaraman. Journey into light: life and science of C. V. Raman/ G. Venkataraman. Raman and his effect / G. Venkataraman. Sir Chandrasekhara Venkata Raman Nobel Prize biography. Sir Chandrasekhara Venkata Raman, 1888-7th November-1948 / [Symposium on crystal physics] Jubilee volume of original papers presented in commemoration of his sixtieth birthday.